Unless otherwise specified, Chinese text in this article is written in the format Simplified Chinese / Traditional Chinese, Pinyin. If the Simplified and Traditional Chinese characters are identical, they are written only once. For the moth known as the "Chinese character", see Cilix glaucata. In Old Chinese including Classical Chinese, most words were monosyllabic and there was a close correspondence between characters and words. In modern Chinese, the majority of Chinese words today consist of two or more characters. Rather, a character almost always corresponds to a single syllable that is also a morpheme. However, there are a few exceptions to this general correspondence, including bisyllabic morphemes (written with two characters), bimorphemic syllables (written with two characters) and cases where a single character represents a polysyllabic word or phrase. Modern Chinese has many homophones; thus the same spoken syllable may be represented by many characters, depending on meaning. A single character may also have a range of meanings, or sometimes quite distinct meanings; occasionally these correspond to different pronunciations. Cognates in the several varieties of Chinese are generally written with the same character. They typically have similar meanings, but often quite different pronunciations. In other languages, most significantly today in Japanese and sometimes in Korean, characters are used to represent Chinese loanwords, to represent native words independently of the Chinese pronunciation (e.g., kunyomi in Japanese), and as purely phonetic elements based on their pronunciation in the historical variety of Chinese from which they were acquired. These foreign adaptations of Chinese pronunciation are known as Sino-Xenic pronunciations and have been useful in the reconstruction of Middle Chinese. The most common process has been to form compounds of existing words, written with the characters of the constituent words. Words have also been created by adding affixes, reduplication and borrowing from other languages. Polysyllabic words are generally written with one character per syllable. [a] In most cases the character denotes a morpheme descended from an Old Chinese word. Pictograms make up only a small portion of Chinese characters. Characters in this class derive from pictures of the objects they denote. Over time they have been standardized, simplified, and stylized to make them easier to write, and their derivation is therefore not always obvious. Examples include 日 rì for "sun", 月 yuè for "moon", and 木 mù for "tree" or "wood". Xu Shen placed approximately 13% of characters in this category, but many of his examples are now believed to be phono-semantic compounds whose origin has been obscured by subsequent changes in their form. Peter Boodberg and William Boltz go so far as to deny that any of the compound characters devised in ancient times were of this type, maintaining that now-lost "secondary readings" are responsible for the apparent absence of phonetic indicators, but their arguments have been rejected by other scholars. Xu Shen (c. 100 AD) placed approximately 82% of characters into this category, while in the Kangxi Dictionary (1716 AD) the number is closer to 90%, due to the extremely productive use of this technique to extend the Chinese vocabulary. The Chu Nom characters of Vietnam were created using this principle. This method is used to form new characters, for example 钚 / 鈈 bù ("plutonium") is the metal radical 金 jīn plus the phonetic component 不 bù, described in Chinese as "不 gives sound, 金 gives meaning". Many Chinese names of elements in the periodic table and many other chemistry-related characters were formed this way. In fact, it is possible to tell from a Chinese periodic table at a glance which elements are metal (金), solid nonmetal (石, "stone"), liquid (氵), or gas (气). Occasionally a bisyllabic word is written with two characters that contain the same radical, as in 蝴蝶 húdié "butterfly", where both characters have the insect radical 虫. A notable example is pipa (a Chinese lute, also a fruit, the loquat, of similar shape) – originally written as 批把 with the hand radical (扌), referring to the down and up strokes when playing this instrument, which was then changed to 枇杷 (tree radical 木), which is still used for the fruit, while the character was changed to 琵琶 when referring to the instrument (radical 玨) . In other cases a compound word may coincidentally share a radical without this being meaningful. The earliest confirmed evidence of the Chinese script yet discovered is the body of inscriptions carved on bronze vessels and oracle bones from the late Shang dynasty (c. 1250–1050 BC). The earliest of these is dated to around 1200 BC. In 1899, pieces of these bones were being sold as "dragon bones" for medicinal purposes, when scholars identified the symbols on them as Chinese writing. By 1928, the source of the bones had been traced to a village near Anyang in Henan Province, which was excavated by the Academia Sinica between 1928 and 1937. Over 150,000 fragments have been found. Left: Bronze fāngzūn (方樽) ritual wine container dated about 1000 BC. The inscription cast in bronze on the vessel commemorates a gift of cowrie shells (then used as currency in China) from someone of presumably elite status in Zhou dynasty society. Right: Bronze fāngyí (方彝) ritual container dated about 1000 BC. An inscription of some 180 Chinese characters appears twice on the vessel. The inscription comments on state rituals that accompanied court ceremony, recorded by an official scribe. Contrary to the popular belief of there being only one script per period, there were in fact multiple scripts in use during the Han period. Although mature clerical script, also called 八分 (bāfēn) script, was dominant at that time, an early type of cursive script was also in use by the Han by at least as early as 24 BC (during the very late Western Han period),[b] incorporating cursive forms popular at the time, well as many elements from the vulgar writing of the Warring State of Qin. By around the time of the Eastern Jin dynasty, this Han cursive became known as 章草 zhāngcǎo (also known as 隶草 / 隸草 lìcǎo today), or in English sometimes clerical cursive, ancient cursive, or draft cursive. Some believe that the name, based on 章 zhāng meaning "orderly", arose because the script was a more orderly form of cursive than the modern form, which emerged during the Eastern Jin dynasty and is still in use today, called 今草 jīncǎo or "modern cursive". By the late Eastern Han period, an early form of semi-cursive script appeared, developing out of a cursively written form of neo-clerical script[c] and simple cursive. This semi-cursive script was traditionally attributed to Liu Desheng c. 147–188 AD,[d] although such attributions refer to early masters of a script rather than to their actual inventors, since the scripts generally evolved into being over time. Qiu gives examples of early semi-cursive script, showing that it had popular origins rather than being purely Liu's invention. Regular script has been attributed to Zhong Yao (c. 151–230 AD), during the period at the end of the Han dynasty in the state of Cao Wei. Zhong Yao has been called the "father of regular script". However, some scholars postulate that one person alone could not have developed a new script which was universally adopted, but could only have been a contributor to its gradual formation. The earliest surviving pieces written in regular script are copies of Zhong Yao's works, including at least one copied by Wang Xizhi. This new script, which is the dominant modern Chinese script, developed out of a neatly written form of early semi-cursive, with addition of the pause (顿/頓 dùn) technique to end horizontal strokes, plus heavy tails on strokes which are written to the downward-right diagonal. Thus, early regular script emerged from a neat, formal form of semi-cursive, which had itself emerged from neo-clerical (a simplified, convenient form of clerical script). It then matured further in the Eastern Jin dynasty in the hands of the "Sage of Calligraphy", Wang Xizhi, and his son Wang Xianzhi. It was not, however, in widespread use at that time, and most writers continued using neo-clerical, or a somewhat semi-cursive form of it, for daily writing, while the conservative bafen clerical script remained in use on some stelae, alongside some semi-cursive, but primarily neo-clerical. Apart from Chinese ones, Korean, Japanese and Vietnamese normative medium of record-keeping, written historical narratives and official communication are in adaptations and variations of Chinese script. Currently, the only non-Chinese language outside of China that regularly uses Chinese characters is Japanese. Vietnam abandoned their use in the early 20th century in favour of a Latin-based script, and Korea in the late 20th century in favour of its homegrown hangul script, although as Korea switched much more recently, many Koreans still learn them to read texts written before then, or in some cases to disambiguate homophones. Chinese characters adapted to write Japanese words are known as kanji. Chinese words borrowed into Japanese could be written with Chinese characters, while native Japanese words could also be written using the character(s) for a Chinese word of similar meaning. Most kanji have both the native (and often multi-syllabic) Japanese pronunciation, or the kun'yomi, and the (mono-syllabic) Chinese-based pronunciation, or the on'yomi. For example, the native Japanese word katana is written as 刀 in kanji, which uses the kanji's kun'yomi since the word is native to Japanese, while the Chinese loanword nihontō (meaning "Japanese sword") is written as 日本刀, which uses the on'yomi of each character. While nowadays loanwords from non-Sinosphere languages are usually just written in katakana, one of the two syllabary systems of Japanese, loanwords that were borrowed into Japanese before the Meiji Period were typically written with Chinese characters whose on'yomi had the same pronunciation as the loanword itself, words like Amerika (kanji: 亜米利加, katakana: アメリカ, meaning: America), karuta (kanji: 歌留多, 加留多, katakana: カルタ, meaning: card, letter), and tempura (kanji: 天婦羅, 天麩羅, katakana: テンプラ, meaning: tempura), although the meanings of the kanji used often had no relation to the words themselves. Kanji that are used to only represent the sounds of a word are called ateji. While foreign loanwords in Japanese words are usually written only in kana, there are some words that normally use ateji to this day, like kurabu (ateji: 俱楽部, katakana: クラブ, meaning: club) and sushi (ateji: 寿司, katakana: スシ). Because there have been multiple layers of borrowing into Japanese, a single character may have several readings in Japanese. 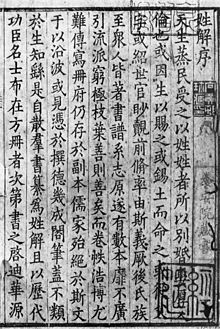 In times past, until the 15th century, in Korea, Literary Chinese was the dominant form of written communication prior to the creation of hangul, the Korean alphabet. Much of the vocabulary, especially in the realms of science and sociology, comes directly from Chinese, comparable to Latin or Greek root words in European languages. However, due to the lack of tones in Modern Standard Korean, as the words were imported from Chinese, many dissimilar characters and syllables took on identical pronunciations, and subsequently identical spelling in hangul. Chinese characters are sometimes used to this day for either clarification in a practical manner, or to give a distinguished appearance, as knowledge of Chinese characters is considered by many Koreans a high class attribute and an indispensable part of a classical education. It is also observed that the preference for Chinese characters is treated as being conservative and Confucian. In Korea, hanja have become a politically contentious issue, with some Koreans urging a "purification" of the national language and culture by totally abandoning their use. These individuals encourage the exclusive use of the native hangul alphabet throughout Korean society and the end to character education in public schools. Other Koreans support the revival of Hanja in everyday usage, like in the 1970s and 80s. In South Korea, educational policy on characters has swung back and forth, often swayed by education ministers' personal opinions. At present, middle and high school students (grades 7 to 12) are taught 1,800 characters, albeit with the principal focus on recognition, with the aim of achieving newspaper literacy. The issue of ambiguity is the main hurdle in any effort to "cleanse" the Korean language of Chinese characters. Characters convey meaning visually, while alphabets convey guidance to pronunciation, which in turn hints at meaning. As an example, in Korean dictionaries, the phonetic entry for 기사 gisa yields more than 30 different entries. In the past, this ambiguity had been efficiently resolved by parenthetically displaying the associated hanja. While hanja is sometimes used for Sino-Korean vocabulary, native Korean words are rarely, if ever, written in hanja. Chinese characters are thought to have been first introduced to the Ryukyu Islands in 1265 by a Japanese Buddhist monk. 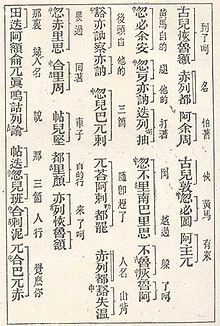 After the Okinawan kingdoms became tributaries of Ming China, especially the Ryukyu Kingdom, Classical Chinese was used in court documents, but hiragana was mostly used for popular writing and poetry. After Ryukyu became a vassal of Japan's Satsuma Domain, Chinese characters became more popular, as well as the use of Kanbun. In modern Okinawan, which is labeled as a Japanese dialect by the Japanese government, katakana and hiragana are mostly used to write Okinawan, but Chinese characters are still used. Several minority languages of south and southwest China were formerly written with scripts based on Chinese characters but also including many locally created characters. The most extensive is the sawndip script for the Zhuang language of Guangxi which is still used to this day. Other languages written with such scripts include Miao, Yao, Bouyei, Mulam, Kam, Bai and Hani. All these languages are now written using Latin-based scripts, while Chinese characters are still used for the Mulam language. Even today for Zhuang, according to survey, the traditional sawndip script has twice as many users as the official Latin script. According to the Rev. John Gulick: "The inhabitants of other Asiatic nations, who have had occasion to represent the words of their several languages by Chinese characters, have as a rule used unaspirated characters for the sounds, g, d, b. The Muslims from Arabia and Persia have followed this method … The Mongols, Manchu, and Japanese also constantly select unaspirated characters to represent the sounds g, d, b, and j of their languages. These surrounding Asiatic nations, in writing Chinese words in their own alphabets, have uniformly used g, d, b, etc., to represent the unaspirated sounds." Public and private Chinese signage in the United States and Canada most often use traditional characters. There is some effort to get municipal governments to implement more simplified character signage due to recent immigration from mainland China. Most community newspapers printed in North America are also printed in traditional characters. 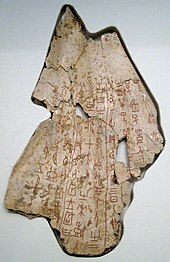 The Shang dynasty oracle bone script and the Zhou dynasty scripts found on Chinese bronze inscriptions are no longer used; the oldest script that is still in use today is the Seal Script (篆書(篆书), zhuànshū). It evolved organically out of the Spring and Autumn period Zhou script, and was adopted in a standardized form under the first Emperor of China, Qin Shi Huang. The seal script, as the name suggests, is now used only in artistic seals. Few people are still able to read it effortlessly today, although the art of carving a traditional seal in the script remains alive; some calligraphers also work in this style. Scripts that are still used regularly are the "Clerical Script" (隸書(隶书), lìshū) of the Qin dynasty to the Han dynasty, the Weibei (魏碑, wèibēi), the "Regular Script" (楷書(楷书), kǎishū), which is used mostly for printing, and the "Semi-cursive Script" (行書(行书), xíngshū), used mostly for handwriting. The cursive script (草書(草书), cǎoshū, literally "grass script") is used informally. 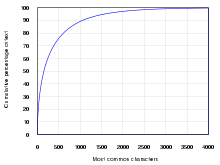 The basic character shapes are suggested, rather than explicitly realized, and the abbreviations are sometimes extreme. Despite being cursive to the point where individual strokes are no longer differentiable and the characters often illegible to the untrained eye, this script (also known as draft) is highly revered for the beauty and freedom that it embodies. Some of the simplified Chinese characters adopted by the People's Republic of China, and some simplified characters used in Japan, are derived from the cursive script. The Japanese hiragana script is also derived from this script. The art of writing Chinese characters is called Chinese calligraphy. It is usually done with ink brushes. 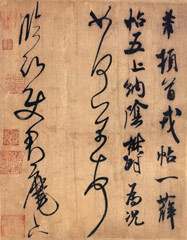 In ancient China, Chinese calligraphy is one of the Four Arts of the Chinese Scholars. There is a minimalist set of rules of Chinese calligraphy. Every character from the Chinese scripts is built into a uniform shape by means of assigning it a geometric area in which the character must occur. Each character has a set number of brushstrokes; none must be added or taken away from the character to enhance it visually, lest the meaning be lost. Finally, strict regularity is not required, meaning the strokes may be accentuated for dramatic effect of individual style. Calligraphy was the means by which scholars could mark their thoughts and teachings for immortality, and as such, represent some of the most precious treasures that can be found from ancient China. The first four characters of Thousand Character Classic in different type and script styles. From right to left: seal script, clerical script, regular script, Ming and sans-serif. The nature of Chinese characters makes it very easy to produce allographs (variants) for many characters, and there have been many efforts at orthographical standardization throughout history. In recent times, the widespread usage of the characters in several nations has prevented any particular system becoming universally adopted and the standard form of many Chinese characters thus varies in different regions. 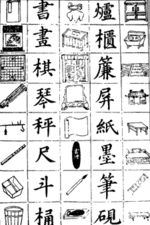 Mainland China adopted simplified Chinese characters in 1956. They are also used in Singapore and Malaysia. Traditional Chinese characters are used in Hong Kong, Macau and Taiwan. Postwar Japan has used its own less drastically simplified characters, Shinjitai, since 1946, while South Korea has limited its use of Chinese characters, and Vietnam and North Korea have completely abolished their use in favour of Vietnamese alphabet and Hangul, respectively. In most other languages that use the Chinese family of scripts, notably Korean, Vietnamese, and Zhuang, Chinese characters are typically monosyllabic, but in Japanese a single character is generally used to represent a borrowed monosyllabic Chinese morpheme (the on'yomi), a polysyllabic native Japanese morpheme (the kun'yomi), or even (in rare cases) a foreign loanword. These uses are completely standard and unexceptional. There are also some extremely complex characters which have understandably become rather rare. According to Joël Bellassen (1989), the most complex Chinese character is /𪚥 (U+2A6A5) zhé listen (help·info), meaning "verbose" and containing sixty-four strokes; this character fell from use around the 5th century. It might be argued, however, that while containing the most strokes, it is not necessarily the most complex character (in terms of difficulty), as it simply requires writing the same sixteen-stroke character 龍 lóng (lit. "dragon") four times in the space for one. Another 64-stroke character is /𠔻 (U+2053B) zhèng composed of 興 xīng/xìng (lit. "flourish") four times. One of the most complex characters found in modern Chinese dictionaries[g] is 齉 (U+9F49) (nàng, listen (help·info), pictured below, middle image), meaning "snuffle" (that is, a pronunciation marred by a blocked nose), with "just" thirty-six strokes. However, this is not in common use. The most complex character that can be input using the Microsoft New Phonetic IME 2002a for traditional Chinese is 龘 (dá, "the appearance of a dragon flying"). It is composed of the dragon radical represented three times, for a total of 16 × 3 = 48 strokes. Among the most complex characters in modern dictionaries and also in frequent modern use are 籲 (yù, "to implore"), with 32 strokes; 鬱 (yù, "luxuriant, lush; gloomy"), with 29 strokes, as in 憂鬱 (yōuyù, "depressed"); 豔 (yàn, "colorful"), with 28 strokes; and 釁 (xìn, "quarrel"), with 25 strokes, as in 挑釁 (tiǎoxìn, "to pick a fight"). Also in occasional modern use is 鱻 (xiān "fresh"; variant of 鮮 xiān) with 33 strokes. The most complex Chinese character still in use may be[according to whom?] biáng (pictured right, bottom), with 58 strokes, which refers to Biang biang noodles, a type of noodle from China's Shaanxi province. This character along with the syllable biáng cannot be found in dictionaries. The fact that it represents a syllable that does not exist in any Standard Chinese word means that it could be classified as a dialectal character. 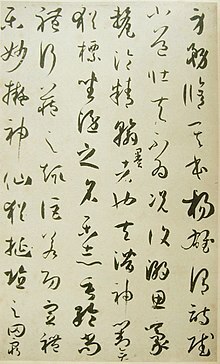 Even the Zhonghua Zihai does not include characters in the Chinese family of scripts created to represent non-Chinese languages, except the unique characters in use in Japan and Korea. Characters formed by Chinese principles in other languages include the roughly 1,500 Japanese-made kokuji given in the Kokuji no Jiten, the Korean-made gukja, the over 10,000 Sawndip characters still in use in Guangxi, and the almost 20,000 Nôm characters formerly used in Vietnam. More divergent descendents of Chinese script include Tangut script, which created over 5,000 characters with similar strokes but different formation principles to Chinese characters. Dozens of indexing schemes have been created for arranging Chinese characters in Chinese dictionaries. The great majority of these schemes have appeared in only a single dictionary; only one such system has achieved truly widespread use. This is the system of radicals (see for example, the 214 so-called Kangxi radicals). ^ Abbreviations are occasionally used – see § Polysyllabic characters. ^ Qiu 2000, pp. 132–133 provides archaeological evidence for this dating, in contrast to unsubstantiated claims dating the beginning of cursive anywhere from the Qin to the Eastern Han. ^ Qiu 2000, pp. 140–141 mentions examples of neo-clerical with "strong overtones of cursive script" from the late Eastern Han. ^ Wáng Xīzhī is so credited in essays by other calligraphers in the 6th to early 7th centuries, and most of his extant pieces are in modern cursive script. ^ (U+9F49) nàng is found, for instance, on p. 707 of 漢英辭典(修訂版) A Chinese–English Dictionary, (Revised Edition) Foreign Language Teaching and Research Press, Beijing, 1995. ISBN 978-7-5600-0739-7. ^ Guǎngxī Zhuàngzú zìzhìqū shǎoshù mínzú gǔjí zhěnglǐ chūbǎn guīhuà lǐngdǎo xiǎozǔ 广西壮族自治区少数民族古籍整理出版规划领导小组, ed. (1989). Sawndip Sawdenj – Gǔ Zhuàng zì zìdiǎn 古壮字字典 [Dictionary of the Old Zhuang Script] (2nd ed.). Nanning: Guangxi minzu chubanshe. ISBN 978-7-5363-0614-1. ^ World Health Organization (2007). WHO international standard terminologies on traditional medicine in the Western Pacific Region. Retrieved 22 June 2015. ^ "History of Chinese Writing Shown in the Museums". CCTV online. Retrieved 2010-03-20. ^ Wood, Clare Patricia; Connelly, Vincent (2009). Contemporary perspectives on reading and spelling. New York: Routledge. p. 203. ISBN 978-0-415-49716-9. Often, the Chinese character can function as an independent unit in sentences, but sometimes it must be paired with another character or more to form a word. [...] Most words consist of two or more characters, and more than 80 per cent make use of lexical compounding of morphemes (Packard, 2000). ^ "East Asian Languages at". Pinyin.info. Retrieved 2018-02-28. ^ Wilkinson 2012, p. 22. ^ Swofford, Mark (2010). "Chinese characters with multiple pronunciations". pinyin.info. Retrieved 4 July 2016. ^ Boltz 1994, pp. 104–110. ^ Boltz 1994, p. 169. ^ Yang, Lihui; An, Deming (2008). Handbook of Chinese Mythology. Oxford University Press. pp. 84–86. ISBN 978-0-19-533263-6. ^ "Carvings may rewrite history of Chinese characters". Xinhua online. 2007-05-18. Retrieved 2007-05-19. ; Unknown (2007-05-18). "Chinese writing '8,000 years old'". BBC News. Retrieved 2007-11-17. ^ a b Paul Rincon (2003-04-17). "Earliest writing'which was found in China". BBC News. ^ Keightley 1978, p. xvi. ^ Robert Bagley (2004). "Anyang writing and the origin of the Chinese writing system". In Houston, Stephen (ed.). 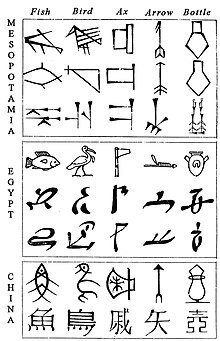 The First Writing: Script Invention as History and Process. Cambridge University Press. p. 190. ISBN 9780521838610. Retrieved 3 April 2019. ^ William G. Boltz (1999). "Language and Writing". In Loewe, Michael; Shaughnessy, Edward L. (eds.). The Cambridge History of Ancient China: From the Origins of Civilization to 221 BC. Cambridge University Press. p. 108. ISBN 9780521470308. Retrieved 3 April 2019. ^ Boltz (1986), p. 424. ^ Transcript of lecture 《楷法無欺》 by 田英章[https://web.archive.org/web/20110711134656/http://www.guoyiguan.com/cgi-bin/topic.cgi?forum=8&topic=1 Archived 2011-07-11 at the Wayback Machine. Retrieved 2010-05-22. ^ "...East Asia had been among the ﬁrst regions of the world to produce written records of the past. Well into modern times Chinese script, the common script across East Asia, served—with local adaptations and variations—as the normative medium of record-keeping and written historical narrative, as well as ofﬁcial communication. This was true, not only in China itself, but in Korea, Japan, and Vietnam." The Oxford History of Historical Writing. Volume 3. Jose Rabasa, Masayuki Sato, Edoardo Tortarolo, Daniel Woolf – 1400–1800, p. 2. ^ "Korean alphabet, pronunciation and language". Omniglot.com. Retrieved 2018-02-28. ^ Coulmas 1991, pp. 122–129. ^ Coulmas 1991, pp. 129–132. ^ Coulmas 1991, pp. 132–133. ^ "Hanja Lesson 1: 大, 小, 中, 山, 門 | How to study Korean". www.howtostudykorean.com. Retrieved 2016-03-09. ^ Kim Hye-jin (2001-06-04). 북한의 한자정책 – "漢字, 3000자까지 배우되 쓰지는 말라". Han Mun Love. Chosun Ilbo. Archived from the original on 2014-12-17. Retrieved November 21, 2014. ^ Hung, Eva and Judy Wakabayashi. Asian Translation Traditions. 2014. Routledge. p. 18. ^ DeFrancis, John (1977). Colonialism and language policy in Viet Nam. Mouton. p. 19. ISBN 978-90-279-7643-7. ^ Coulmas (1991), pp. 113–115. ^ a b Zhou, Youguang (September 1991). "The Family of Chinese Character-Type Scripts (Twenty Members and Four Stages of Development)". Sino-Platonic Papers. 28. Retrieved June 7, 2011. ^ 唐未平 Tang Weiping. "Research into survey of the scripts used by Zhuang in Guangxi" 《广西壮族人文字使用现状及文字社会声望调查研究》. ^ Rev. John Gulick (November 1870) "On the best method of representing the unaspirated mutes of the Mandarin dialect," The Chinese Recorder and Missionary Journal, vol. 3, pp. 153–155. ^ Vanessa Hua (2006-05-08). "For students of Chinese, politics fill the characters / Traditionalists bemoan rise of simplified writing system promoted by Communist government to improve literacy". M.sfgate.com. Retrieved 2018-02-28. ^ Mair, Victor H. (September 2009). "danger + opportunity ≠ crisis: How a misunderstanding about Chinese characters has led many astray". Retrieved August 20, 2010. ^ Montucci, 1817. Urh-chĭh-tsze-tëen-se-yĭn-pe-keáou; being a parallel drawn between the two intended Chinese dictionaries; by the Rev. Robert Morrison, and Antonio Montucci, LL. D.
^ "Polysyllabic characters in Chinese writing". Language Log. Retrieved 2016-04-11. ^ Pulleyblank 1984, p. 139. ^ Wilkinson 2012, p. 46. ^ Hida & Sugawara, 1990, Tokyodo Shuppan. ^ "What are the Jōyō Kanji?". sci.lang.japan FAQ. Retrieved 11 November 2015. ^ "What are the Jinmeiyō Kanji?". sci.lang.japan FAQ. Retrieved 11 November 2015. ^ "Kanji Kentei". sci.lang.japan FAQ. Retrieved 11 November 2015. ^ Koichi (2011-04-06). "The Ultimate Kanji Test: Kanji Kentei". Tofugu. Retrieved 11 November 2015. ——— (1994). The origin and early development of the Chinese writing system. New Haven: American Oriental Society. ISBN 978-0-940490-78-9. ——— (1996). "Art, Ancestors, and the Origins of Writing in China". Representations. 56: 68–95. JSTOR 2928708. Kern, Martin (2010). "Early Chinese literature, beginnings through Western Han". In Owen, Stephen (ed.). The Cambridge History of Chinese Literature, vol. 1: To 1375. Cambridge: Cambridge University Press. pp. 1–115. ISBN 978-0-521-85558-7. Zhou, Youguang (2003). The Historical Evolution of Chinese Languages and Scripts. Translated by Zhang Liqing. Columbus: National East Asian Languages Resource Center, Ohio State University. ISBN 978-0-87415-349-1. Walter Henry Medhurst (1842). Chinese and English dictionary: containing all the words in the Chinese imperial dictionary; arranged according to the radicals. 2 volumes. Parapattan: Walter Henry Medhurst.